Fulham defender Scott Malone believes his side have momentum and are the Championship play-off favourites. They play Reading at Craven Cottage on Saturday in the semi-final first leg, before the away leg on Tuesday, 16 May. Fulham finished sixth, but lost just two of their final 17 league games. "Being seventh up until two weeks ago has helped us. We needed to carry on winning games to get into the top six, whereas the other three teams already knew they were in," Malone said. "The momentum is with us, we're playing really well and our form is good." Fulham have beaten Reading 5-0 and 4-2 in their past two home meetings. 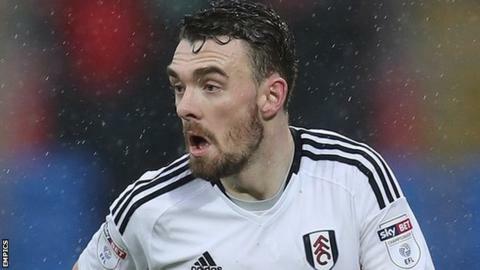 Left-back Malone believes Fulham's mix of youth and experience and the intensity with which they have been forced to play at in recent weeks will stand them in good stead in the play-offs. He told BBC Radio London: "Huddersfield and Sheffield Wednesday have rested a few players over the past week. We've not done that - we couldn't due to the position we were in. "We're pretty much the form team and possibly the favourites at the minute, which is a bit strange because we've been seventh, eighth and ninth all season. To go in as favourites is a little bit of a turnaround."